Defensive aggression occurs when the cat perceives itself to be under a threat from which it cannot escape. This type of aggression may be recognized by the typical body postures which accompany it: crouching, flattening of the ears against the head, hissing and spitting, piloerection (hair standing up). These are all signals to the other animal or person that further approach is likely to lead to a defensive attack. The defensively aggressive cat only attacks when approached, it does not seek out the source of the threat or pursue it if it withdraws. They don’t want to fight but will if the threat comes closer. Its self-defense. The best way to deal with a defensively aggressive cat is to avoid the cat until they calm down. You should not try to comfort the cat by approaching or picking them up. The cat should be left alone until it relaxes enough to eat, play, or show affectionate behavior. In some cases, several hours or more are required for the cat to settle down. The person who is injured by the defensively aggressive cat is one who did not heed the cat’s warning signals. Children are often the victims and should be taught to recognize the pertinent body language and to respect the directive to “back off”! Some cats exhibit this type of aggression toward strangers who visit the home. If the cat has grown up with limited experience with people other than the pet parents, it is more likely to fear strangers that visit. It is also possible for a cat to adopt this attitude toward other people if it was at one time mistreated or teased and therefore will be distrustful of anyone who is not “family”. 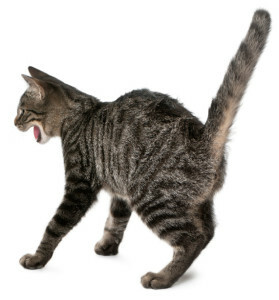 To help a cat overcome its fear of strangers, it will be necessary to employ the time-tested principles of desensitization and counterconditioning. Recruit cat-loving friends to come over on a regular basis. It is important to minimize any behaviors that would frighten the cat (eg., loud voices and quick movements) and at the same time encourage a nonfearful behavior in the cat (eg., eating or playing). Ask your cat-friendly acquaintances to sit on the couch or even better, on the floor after entering your home. Give them your cat’s favorite food treats which for training purposes, will only be offered by guests, not the family. If the cat will not approach the visitor, it can be tossed to him. A toy attached to a long fishing pole is another way to win over a reluctant cat. When Kitty begins to connect good times and good food with visitors who come through the door, the hissing will be replaced with purring. Patience and persistence, as always, pay off.